Here is the eligibility criteria for the Calcutta High Court job recruitment for Lower Division Clerk, Stenographer Grade-III and various posts. In below image get the post name with their pay scale, total vacancy category wise and essential qualification required. Age Limit: for stenographer posts aspirants should age below 37 years and 18-40 for others. 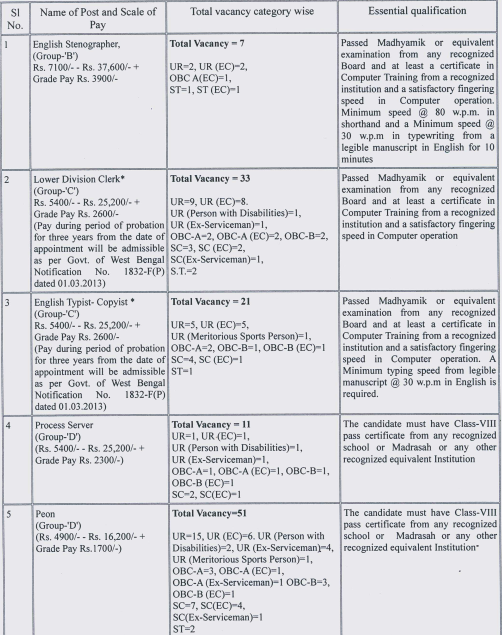 Application Fee: General/OBC Rs. 250 and SC/ST RS.150. Fees should pay through IPO payable at G.P.O, Kolkata. PO Chinsurah, Dist Hooghly, Pin-712101. How to download the admit card: Admit card/ hall ticket will be send at their address, if any cases someone not get the hall ticket, collect duplicate admit card form the website www.calcuttahighcourt.nic.in.